Avanti Communications Group plc (Avanti) and MainOne have signed an agreement to jointly improve broadband penetration across Nigeria by providing the latest Ka-band based satellite communication services to enterprises located in remote areas of the country. Under this arrangement, MainOne will leverage Avanti’s newest satellite, HYLAS 4, launched in April of 2018, to enable highly flexible capacity services with 100 percent country coverage of Nigeria. Such coverage is critical and will accelerate the time to deploy internet broadband services into remote areas that are difficult to reach via fiber infrastructure. 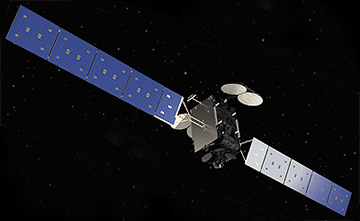 Artistic rendition of the HYLAS-4 satellite. The partnership will also include the deployment of Avanti’s ECO initiative, which bundles broadband access, solar power and embedded WiFi services for schools and small communities, ideal for deployment in remote parts of the country where power availability and connectivity services remain a challenge. The partnership is also backed with the commissioning and launch of Avanti’s new Gateway Earth Station (GES) in Nigeria, hosted at MainOne’s Tier III Data Centre ‘MDXi’. Libby Barr, COO at Avanti, said the company is delighted to be partnering with MainOne and looks forward to building a strong relationship to enable rollout of satellite broadband services across West Africa. Avanti’s products will greatly complement MainOne’s existing fiber-based networks by providing reliable connectivity services to their enterprise customers beyond the immediate fibre reach. Funke Opeke, Chief Executive Officer of MainOne, added that this partnership with Avanti provides Nigeria the opportunity to accelerate expansion of broadband internet via satellite, to bridge the digital gap and improve digital transformation for more Nigerians. Such services are most critical for the Oil and Gas sector as well as for the delivery of social and educational services into rural areas of the country. Beyond connecting institutions, Avanti’s ECO solution also addresses the needs of their immediate communities and will accelerate getting more of our rural communities online.